Brian is the invisible boy. Even his teacher, Mrs. Carlotti doesn’t notice him because Nathan is too loud and Sophie is a whiner. When it’s time to pick teams, Brian is left out. And at lunchtime, Madison invited everyone to her birthday party except Brian. Brian loves to draw, it’s what he does best. He sits quietly at a table and draws fire-breathing dragons, space aliens, pirates, and superheros. Then one day, Mrs. Carlotti introduces a new boy to the class. His name is Justin, and looks a little different than the rest of the kids. At lunch, Madison makes fun of his chopsticks, and J.T. makes fun of his bulgogi, calling it Booger-gi. All the kids laugh, except Brian, he just sits there feeling invisible. The next day Justin finds a note in his cubby. It was from Brian and it said, ‘I thought the bulgogi looked good.’ And he drew a picture of himself eating with chopsticks. That afternoon, Justin played with Brian on the playground. But when it was time to team up for a special project, Emilio pairs with Justin, leaving Brian out again. Luckily for Brian, Justin adds him to their team. When Mrs. Carlotti gives the directions, the boys are work together to put on a three-man play. From then on, Brian didn’t feel invisible anymore. Justin and Emilio make room for him at their lunch table and they share a bag of cookies together. Trudy Ludwig tells a very important story about friendship and inclusion. She gets right to the meat of the problem that both Brian and Justin face in school, and helps the children solve their own problem. Her examples of inclusion serve as real-life solutions for countless children in schools everywhere. Patrice Barton’s illustrations are soft and tender. 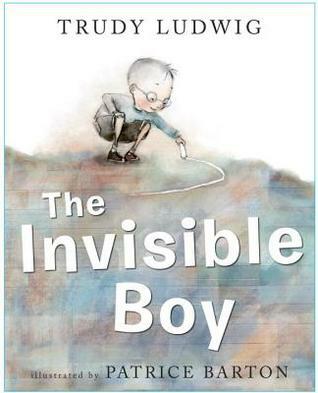 She allows the reader to see Brian in outline form only when he is feeling invisible, and adds color a little at a time as he becomes accepted by his peers. In contrast, all of the other characters are painted in soft watercolors further emphasizing Brian’s feelings throughout the story, and I think also showing that the other characters are not necessarily mean-spirited just unaware of Brian’s feelings. Inclusion doesn’t have to be a major event, it can be as simple as inviting someone to sit at your lunch table or letting them join your group at work or play. I adore the paintings in this story. My heart goes out to the invisible Brian on every page. This is a beautifully written and illustrated book. I highly recommend it to my teacher friends, parents, and children. Sounds like a lovely story with some great life’s lessons. I like the way you describe the illustrations as they appear to be, by your description, in synch with the storyline. Thank you, Stephanae. That means a lot coming from you, I’m so pleased you liked it! Oh my goodness yes. You’ve been on my mind Juliana but after my move and subsequent “stuff” I had a heck of a time trying to find your blog. Today I just took some time and went through all the ones I follow and found you. I really enjoyed this book! Very thorough view. Enjoyed your thoughts.